Nonius Marcellus was a 5th-century Roman grammarian known for his only surviving work, a dictionary of Greco-Roman Latin literature ranging from Plautus to Apuleius, the tragedies of Accius and Pacuvius, works of Varro and Cato, and the satires of Lucilius. Nonius organized the work in such a manner that each entry includes a short definition of the words found in the plays followed by a quotation using the word, perhaps from the play itself. The title of the work has varied since its first printing, but the most commonly accepted title is ‘De proprietate latini sermonis’. The vocabulary terms that Nonius decided to feature include mythological terms, descriptions of weapons, food, theatre and literature terms, and much more. This 1490 first edition was published by Bernardino di Cuori, and for the first time, in conjunction with Simon of Lovere. (Proctor). 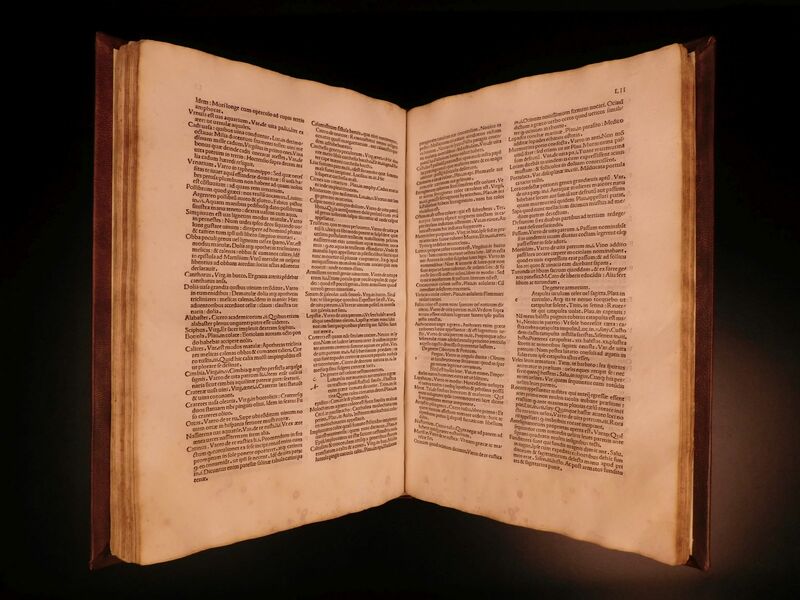 An exceedingly rare, complete Incunable Nonius encyclopedia! Venetiis : Per Bernardinum de Cremona & Simonem de Luero(IS), Venezia : Cori, Bernardino de ; Venezia : Luere, Simone da. xv Decembris 1490. First leaf title – Nonius Marcellus Festus Pompeius Varro.